Who said that only the weekend was made for fun? It’s Thursday night and we’ve got just what you need to make the night great. Hop aboard our Thursday NYC after work cruise and get ready to take on the city!Set sail with us as we take Thirsty Thursday to a new level on our cruise! Party with your friends on our Thursday NYC after work cruise and enjoy views of New York City as you party to your favorite songs. Get ready to get those drinks pouring on the seas and book your tickets aboard our cruise today! This Thursday NYC after work cruise is going to sail you into the night as you dance and catch views of the Big Apple. Take in the sights of your favorite city and enjoy the city skyline and all of its landmarks. With nothing but beautiful night views of NYC being all yours to enjoy, where else would you want to spend the night? Our Thursday NYC after work cruise will keep the night filled with music as you enjoy our live DJ onboard. Dance into night as you enjoy your favorite hits of this year. Nothing but the Top 40, Pop, Dance, and Hip-Hop hits will be blasting as you enjoy a Thursday night out like you never have. Now, the night just wouldn’t be complete without some drinks in your hand. Your Thursday NYC after work cruise will have fully stocked cash bars onboard keeping the drinks pouring all night! Sip on your favorite drink as you sail through the city and skip the bars for the night! Want to make this Thursday night even better? 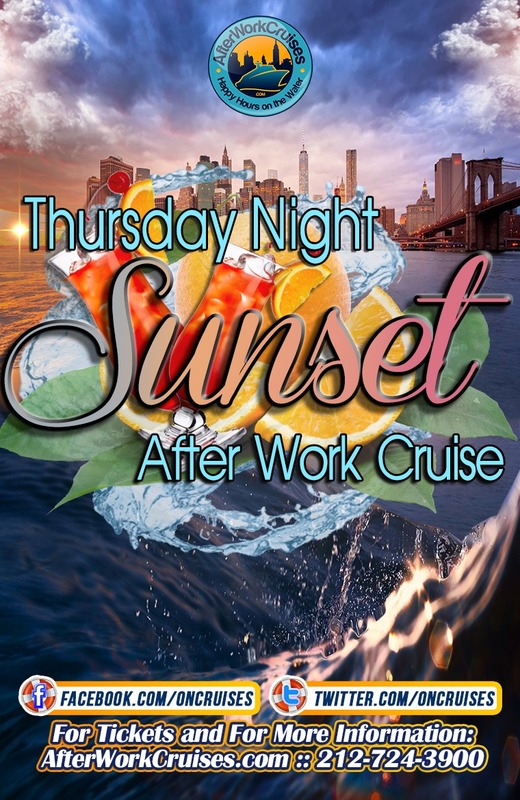 Add in an open bar package with your ticket and keep those drinks pouring on our Thursday NYC after work cruise! We’re getting the weekend started early this year and you just have to join us. Don’t miss out on partying with us on our Thursday NYC after work cruise. Enjoy views, drinks, and music as you make Thursday night the new Friday in 2018 with us!